2.Created by one user to another user. Note: This form is limited to users with Database Level Security access. The form is not enabled for Enterprise Application Level Security users. 1.Click Forms from the Open section of the EQuIS Home Ribbon. 2.Select the Copy User Reports Form from the list of forms. •Copy User Reports form has been updated to allow report names to be up to 255 characters. •The "Integrity constraint..." error, received intermittently upon selecting the copy button, is also a known issue and we are continuing to investigate to confirm the cause and resolve in a future release. 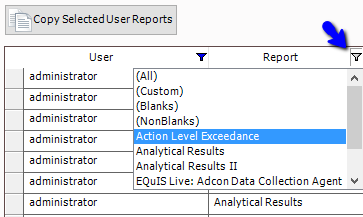 1.Select the source User Report from the table listing all available user reports. 2.The list may be filtered from any of the System Table columns shown, which include the following. 1.Select the User Report to copy as described above. 2.Select the System Report to which the User Report will be copied using the first drop-down menu at the top of the form. (target report should include same parameters as source report, otherwise behavior will differ). 3.Click Copy Selected User Reports. 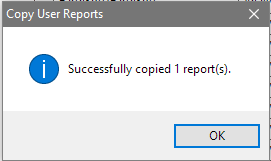 A notice will appear indicating the User Report was successfully copied. 2.Select the User to whom the report will be copied from the second drop-down menu in the form.